It was the early to mid 1980s, and everybody was having fun. But some of us Datsun Nissan fans couldn’t afford a 280Z or 300ZX, yet we wanted a sporty ride. What to do, oh, what to do. 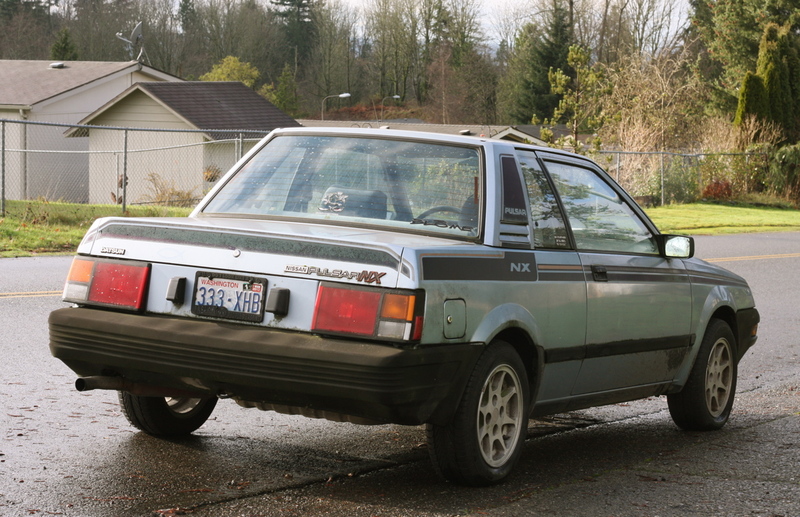 Enter the first generation Pulsar NX into the American market in 1983. Its timing was superb, since the Sentra Sport Coupe was still a few years away, and a regular Nissan Sentra (2-Door, 4-Door, 5-Door Wagon, and 3-Door Hatchback) was for the sensible, not the sporty. I nearly ordered one of these puppies (I worked at NMMC at the time), but since a 1984 Sport Truck was already in the stable, something more car-like and less fun was in order to replace that wretched Pontiac T100 that I just had to have at one time. 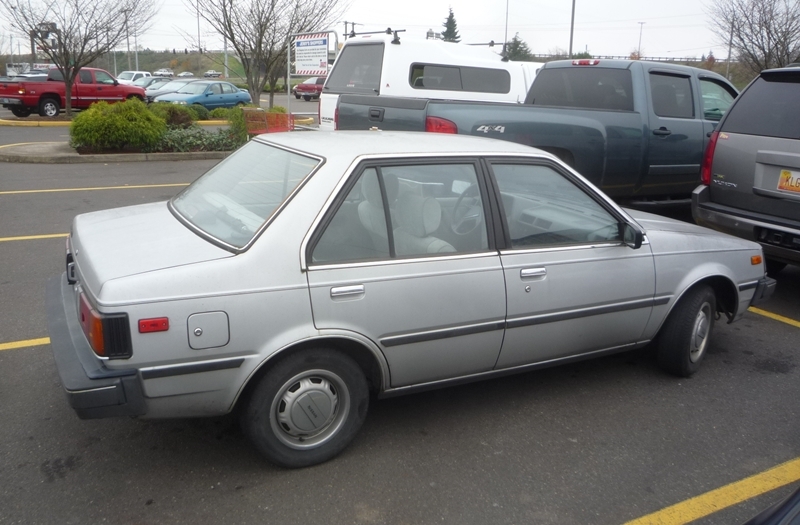 So I took the sensible route and got a 1985 Sentra 4-Door XE with a 5-speed. This NX would have been more fun. And a lot more sporty. From the rear, the NX’s straight-line angles and creases abundantly abound. The car was a period-correct wedge design with the only curves being the wheel openings and tires. It looked modern (For the time), maybe even a little futuristic… like a small space ship. And maybe that was its attraction and best feature. OK, this car isn’t a muscle car or even close, but it did offer a Turbo Package with a 1488 cc (E15ET turbo) I-4 with 94 horsepower spinning the front wheels. Everybody else here got the 1597 cc (E16) I-4 with a measley 70 ponies. Handling was fair, but “sporty” and “sports car” are two different terms. Its interior might be described as “Adequate, but uninspired.” All the pieces were there… full gauges, sporty seats, 3-spoke steering wheel… But somehow it just seems this could have been… better. “Holy Drop Top, Batman!” Wow, we Americans didn’t get this, but the NX (They were called the EXA over there [Which was anywhere but here]) was offered in true convertible form. However in the 80s we didn’t need soft tops, we had T Tops. 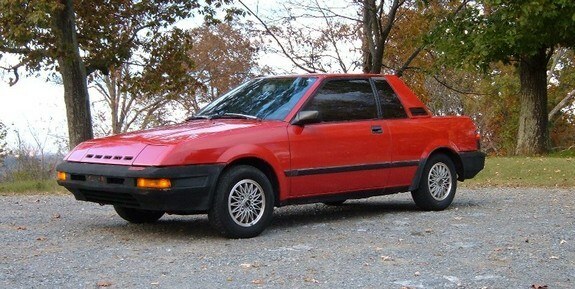 The Pulsar NX had a pop-up/removable sunroof. Well, some of them did. There was a second generation NX sold here as well. Please stay tuned. Image Credits: Our first Pulsar NX image was found at CarDomain.com. The rear shot came from BlogSpot.com. Its profile photo is from Hooniverse.com. The engine image came from Photobucket.com. The NX interior photo is from CoPart.com. The EXA convertible picture was found at Wikipedia.org. May 16 Weekly Open Thread: "I'm Mad As #*!! And I'm Not Going To Take It Any More!" Car Spotters' Challenge #175: Got No Job, We Don't Care. Got No Money, We Don't Care. Don't Plan To Pay Us? THAT'S When We Care!